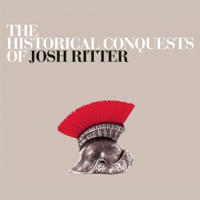 Titles can be deceiving: The Historical Conquests of Josh Ritter is not, in fact, a prog-rock concept album. It’s completely devoid of canny synthesizers, and it seems unlikely that Ritter will perform the album in elaborate costume. Nor is the album an anthology of dusted-off Appalachian folk songs-although, if Bruce Springsteen is any kind of barometer, maybe more artists should be dusting off old folk songs. In fact, it’s difficult-and probably fruitless-to try to assign Ritter’s latest into any strict genre classification at all. Oh, one could take the easy road and simply lump it under “Americana,” but it’s only an Americana album in the same way that The Trumpet Child is. Ritter’s the real deal; he’s not interested in paying homage to the past so much as twisting it to fit his own purposes. There are familiar sounds and styles here, to be sure, but they’re all filtered through Ritter’s distinct personality, serving his own ineffable and undeniable vision. This is evident in everything from the songwriting to the production. Recorded on the road, Historical Conquests is a crazy, careening record, alive with fresh ideas and zipping from place to place like a derailed freight train. But Ritter is a capable engineer, and he somehow manages to make it all stick together; whether he’s playing the lovelorn country troubadour or the sophisticated soul singer, he proves to have enough knowledge of American music to find his own place within the tradition, but enough of a restless creative spirit to know when to bend the rules. Ritter’s a wartime songwriter who knows that only love will win the day, and so these songs strike a curious tension. He can do the gentle crooner thing just fine-sample “Wait for Love” and “The Temptation of Adam”-but military imagery is never far off. The latter is perhaps the best example of Ritter’s sensitive ear for the times in which we live, as he sings about a nervous bomber who finds a fragile and precarious love inside a nuclear bunker during World War III. “Right Moves” is a slick, smooth soul number, capped by strings and horns. The full orchestra also finds its way onto album standout “Rumors,” a swaggering little number about a confused and heartbroken musician trying to play his pain away. “Next to the Last True Romantic” is a rollicking country howler, while “Wait for Love” is a languid ballad built around twinkling piano and lazy guitar strumming. At times it’s a bracing and effecting listen, but, most of all, it’s a wildly imaginative and relentlessly engaging album, bursting with energy and creativity, wisdom and wit. And that’s what makes the album’s title fit-Ritter’s defiant, dogged vision has subdued all the lazy clichés of American music, recasting them in his own image.